Kristin Larsen, co-creator of Become a Pinterest VA Today! It’s a good bet that you’ve spent some time on Pinterest. After all, the platform boasts a community of 150 million people. While most of us use it just for fun, pinning new recipes, crafts, and everything else under the sun, the platform is actually a powerful marketing tool. 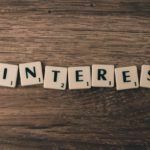 Would it surprise you to know that 87% of Pinners have reported making a purchase based on Pinterest? That means businesses and bloggers are itching to grow their presence on Pinterest. However, they don’t necessarily have the time or knowledge to do so. Enter the Pinterest VA. But what exactly is a Pinterest VA? And how do you acquire the skills to become one? Who better to tell us all about it than Kristin Larsen, Pinterest expert and co-creator of the course, Become a Pinterest VA TODAY!? In this interview, Kristin shares all about what a Pinterest VA is and does, and how you can create extra income for your family doing something you already love to do – spend time on Pinterest. What exactly is a Pinterest VA, Kristin? A Pinterest virtual assistant basically means that you’re helping someone with Pinterest online and from afar. There are TONS of services that can fall under the Pinterest virtual assistant umbrella. Pinterest VAs can help with setting up or updating Pinterest accounts, converting personal accounts to business accounts, setting up a pinning schedule, creating and designs pins… the list goes on and on! What kind of skills do you need? Is it enough to be able to follow guidelines to succeed? You don’t have to have any experience to get started as a Pinterest virtual assistant – but you do need to be willing to learn a new skill, be proactive and ready to put in the work! There is no easy button – you will need to be able to set aside some time each week to work on the course and go through each lesson. With that being said, you need to be comfortable working online, such as checking emails, the basics of the Pinterest platform and comfortable interacting with potential clients. 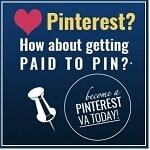 Become a Pinterest VA TODAY! is going to teach you everything you need to know to specialize as a Pinterest virtual assistant, including technical training, what services to offer, how much to charge, how to find clients and more! By following each module and lesson, you’ll learn all the training you need to succeed. Would it be a suitable option for work-from-home moms who need flexibility? Yes! As a Pinterest VA, you get to choose how many clients you would like to work with and how many hours per week you can work. This is really great for work-from-home moms because you can work at a time that fits your needs. This could be first thing in the morning, during nap time, while the kids are at school or in the evening. Working online as a Pinterest VA is one of the best and most flexible jobs out there. Can you make a decent income working as a Pinterest VA part-time? The short answer is yes, but this really comes down to how many clients you would like to work with and how much time you have available to work as a Pinterest VA. Like any other job, our students enter the work force looking to gain experience so they charge a lower rate. Unlike most regular 9-5 jobs, the quicker our students gain experience and get results, their rates can really increase! Many students start in the $15-20 per hour range and go on to charge $50 per hour or offer monthly packages. What kind of office equipment do you need and what are the start up costs? As long as you have access to the internet and a computer, you can get started working online! Since this is a virtual job, you have the ability to work from anywhere. We have students that work from all over the world, so you can live and work anywhere. What is the best part of this career for you? When I launched my Pinterest virtual assistant business, I loved the flexibility that came with the job. At the start of my Pinterest VA career, I was still at my day job, so I could work in the evenings and on weekends. As my company grew, I was able to take on more clients, increase my income and quit my day job! 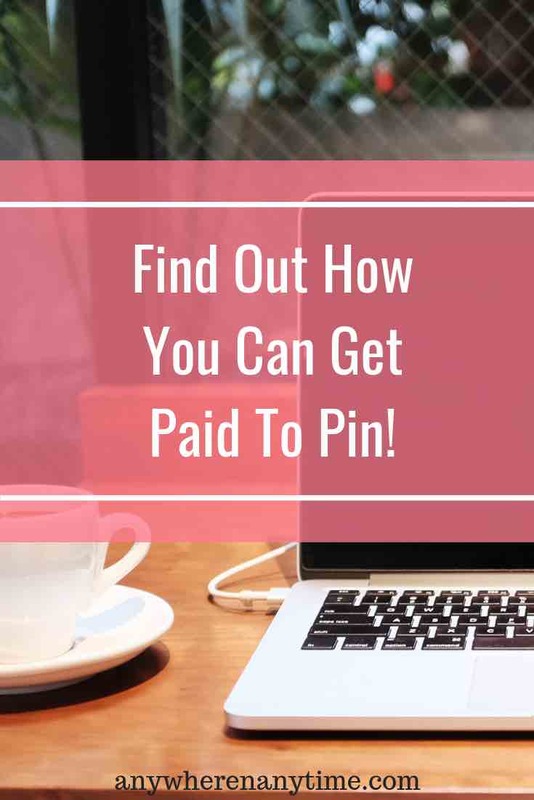 I also found it really rewarding to be able to offer a service that helped other people get results from Pinterest – I loved getting paid to pin! Do you have any advice for moms (or dads) who want to give it a go? Getting paid to pin on Pinterest is a great way to earn additional income! In order to be successful, you need to be ready to invest in yourself and take the time to learn a new career. The most successful students are organized, have a ‘go-getter’ attitude and have good time management skills. Once you have signed up for the course, you will have access to the material 24/7 and can go at your own pace. You are going to have access to a TON of technical training with Pinterest, Tailwind (the scheduling tool we recommend) and Canva (the free graphic tool we recommend). If this opportunity sounds interesting to you, be sure to check out the Become a Pinterest VA TODAY! review and don’t forget to join the waitlist so that you’ll be notified when enrollment for the course is open. How much do you already know about Pinterest? Do you think it sounds like an interesting career? I’d love to hear your thoughts and answer any questions you may have in the space below. This is the first that I have heard about Pinterest VA. What an interesting way to make money. What is the cost of the course and are there upsells or is it one and done? How long does it take after completing the course to get clients? And how difficult is it to get clients? Presently the course is $299 (or 2 installments of $159), Ed. There are no upsells. In fact, you have access to the course for life. So once you buy it, you have access to all the updates and new material they add to the course. They do increase the cost of the course sometimes, but once you’ve bought it, you have life-time access at no further cost. Some of the graduates I’ve communicated with have gotten clients within days and for others it takes longer. How difficult it is, is relative I guess and just depends on the work you put into it. There are so many entrepreneurs who want to increase traffic to their sites – you just have to go catch them!